What does my van design look like? I spent month thinking and sketching what a Van designed for an outdoor sport enthusiast should be. Since my models are registered to the National Institute of Intellecual Property, I can be identified has their creator. It’s time to reveal my secrets. I developed new skills during this experience: padding, program writing or welding. 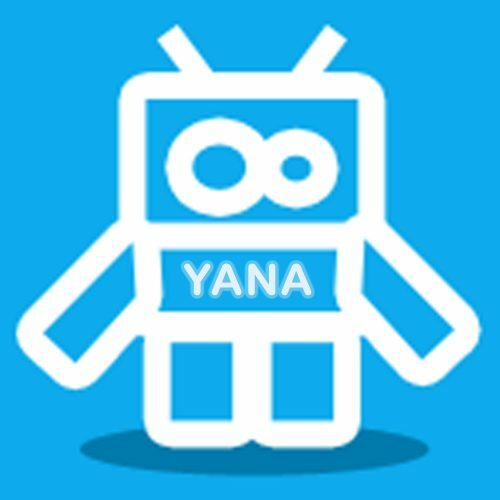 I’m still exploring new paths to upgrade my products and implement high electronic technology. 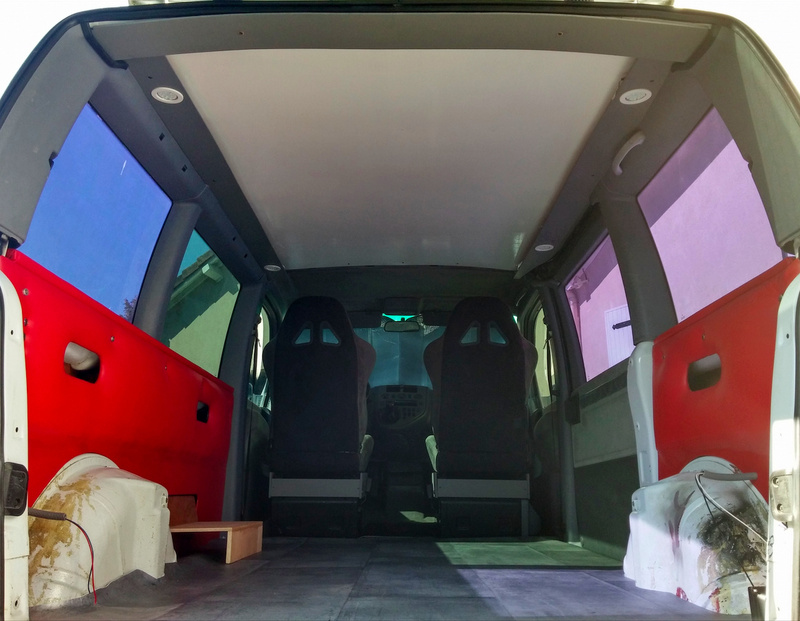 My goal: improving the ease of use and general comfort of my van design. Today I want to give you an insight about my current progress. Moreover, if I need to use my Van for another purpose, I can remove my convertible bed in 10min to beneficiate all the surface. 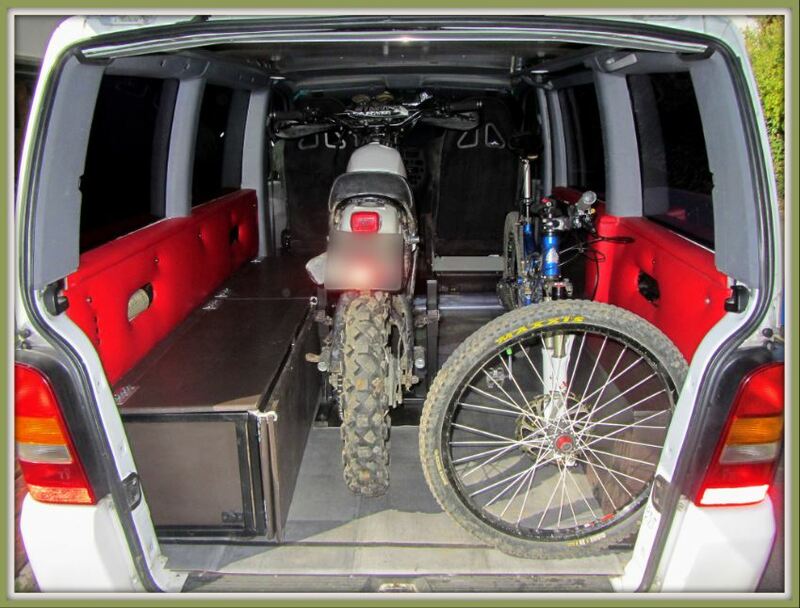 What makes this Van design specific for outdoor sport lovers? These three criteria have been taken really seriously when I made my SUV layout. I used marine plywood for its low weight, high resistance and its low bulk. My convertible bed use a steel structure saving space and super resistant. The combo foam/leatherette is lightweight, scratch-proof and easy to clean. Bathroom lino is easy to cut, lightweight and easy to clean. 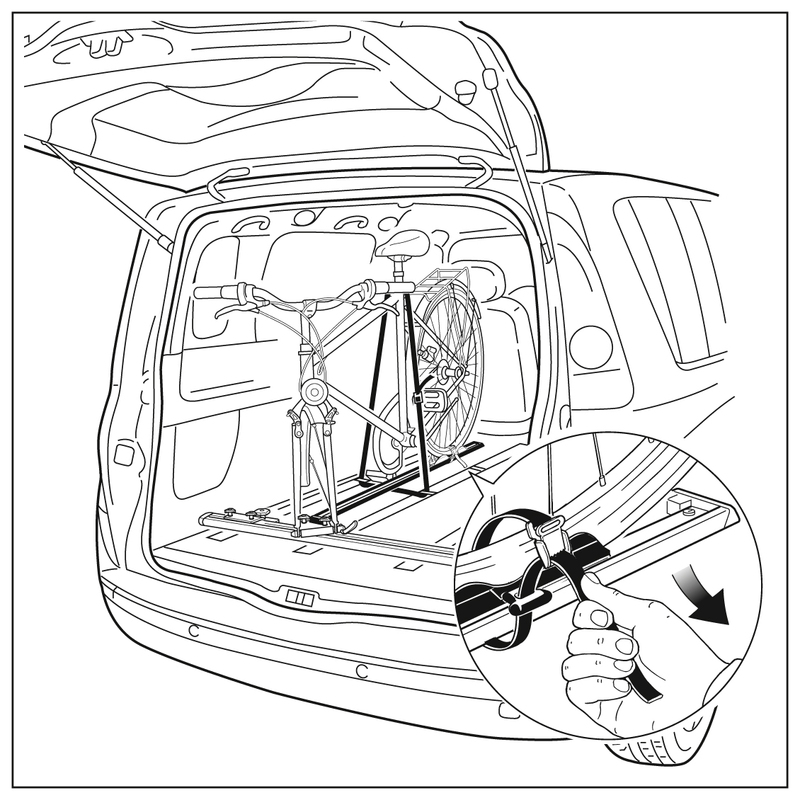 I’ve developed specific fixations to load and hold my motorbike, mountain bike and snowboard. Those fixations also protect my van design from scratches. As you can see I don’t need straps to hold my motorbike and my front axle hold my mountain bike. I really like my shower because this one is well integrated. I haven’t seen anybody doing it my way with a hose running through the tailgate and using quick connectors. Also, this shower doesn’t need any tap since it is operated by a PLC. On the other hand, this is the best way to reduce my ecological footprint. 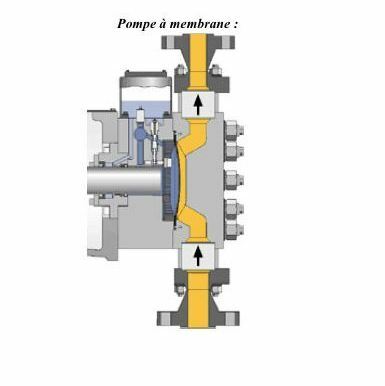 I’ve chosen a pump strong enough to produce an interesting pressure and flow although this is nothing comparable to a high pressure water gun. 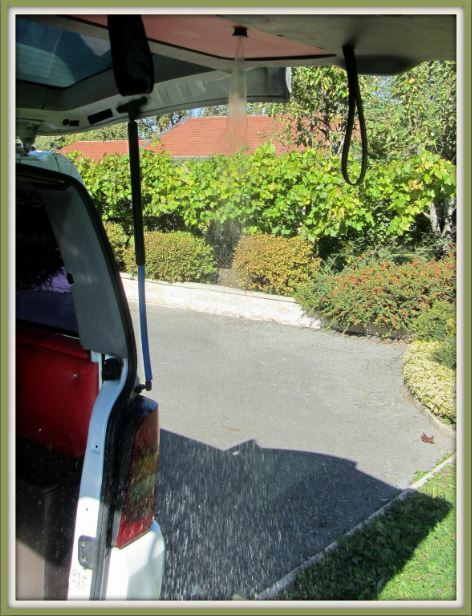 With the right pressure jet wash I can clean most of my motorbike or Mountain Bike before I load them into the van. In this way, I have something less to worry about when I’m back home and I save some precious time to do something else. 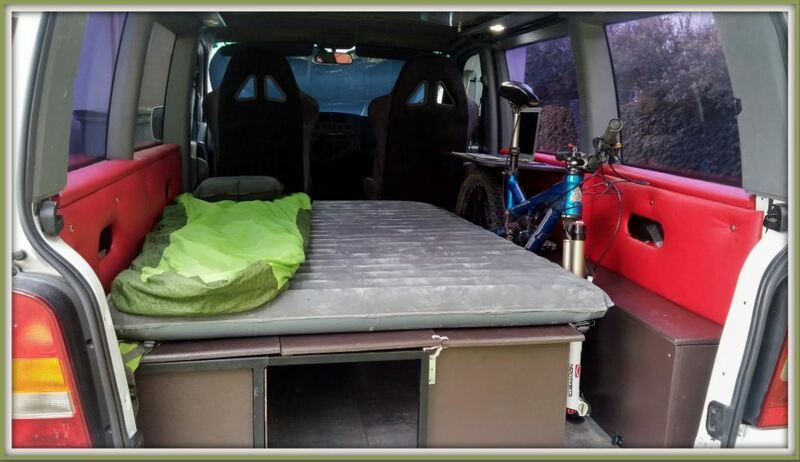 This comfort goes even further: If I don’t need to unload my van for another purpose, this one is already all set for my next trip! 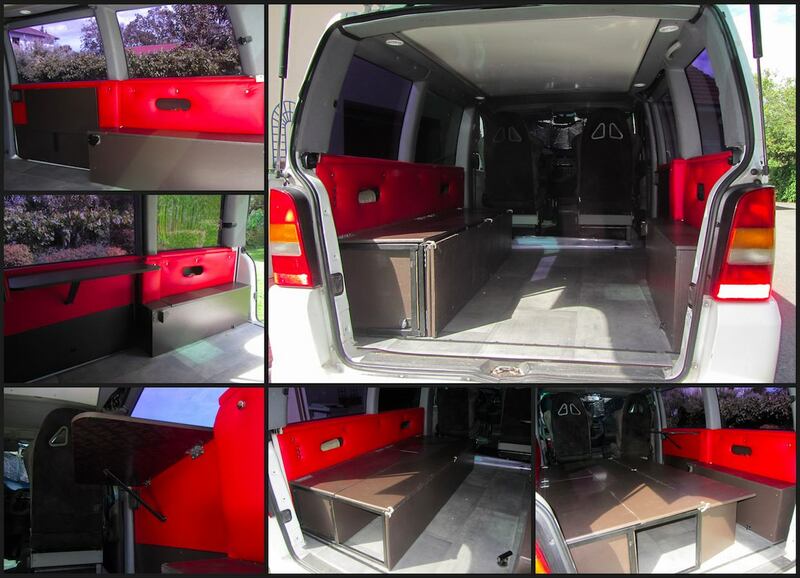 When I made this van design, I wrote down my needs on a list. Building the simplest and tiniest van was the main thing, managing my electricity consumption was the second. My backpacker experience has taught me a lot about what matters and what doesn’t. Consequently, including high consumption devices was a non-sense. The electric installation to produce this amount of energy isn’t worth the cost. Indeed, getting another car battery, plugging a switch charger between all of them and lead their energy towards an inverter cost around 500€ and 20kg for the cheapest installation. I prefer to shop everyday fresh products and store them in my cooler. I don’t use my van for trips longer than two weeks. Instead I plugged all my electric installation onto my 12V 90aH car battery. This one supplies 12V DC components able to unleash 72W max when I need a lot of power for two minutes or as low as 4.5W to power LED light. With this configuration I’m always able to start my car engine. My cooking and sleeping gear are the same I take with me when I go trekking. Indeed, these ones are already designed to be lightweight and compact when packed. What do you thing about this Van design? May be my SUV layout can only take two people but at least, it does it perfectly! If you have any question about my layout or if you want a price range about how much it would cost you, let me know!